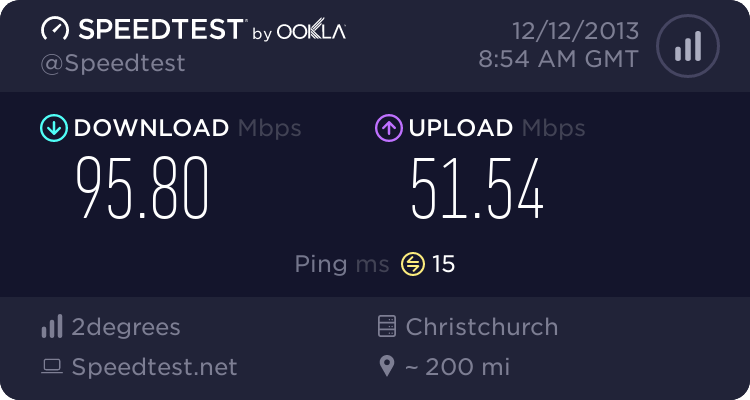 Well, we finally have Fibre! We chose Snap! as our ISP, and so I'd like to give some thoughts regarding the install process (up to where we are at so far). First, the install to date has taken approx 3.5 weeks. As we live up a ROW, this was not unexpected. Our LFC is UltraFast Fibre. So the signup process started on Nov 5. We signed up online, and was a very straightforward process. We elected not to get a FrtizBox. The plan we chose was 100/50 fibre with an extra 100GB data pack. Two days later the contractor turned up to start digging holes not realising it was a ROW and so referred the matter back to UFF. UFF sent us a consent form that day for us and our neighbours to sign. We sent that back on the Monday. Note from this time there was no contact from Snap! whatsoever (apart from the automated welcome email). Also, no one from UFF or transfield ever gave advanced warning for when they were going to turn up. Thankfully my father works from home now and so there was almost always someone home. So on the Monday or Tuesday (can't remember which) a "Designer" from UFF came to scope the works. Then nothing (appeared) to happen. Then on Monday 25th Nov, it all finally started to happen. On Monday, they (hand)dug the required holes in the drive and berms. Tuesday, it was the underborers turn. Wednesday the guy came to fit the ETP and run ducting to our patch pannel. Thursday, the ducting was all prepared for the fibre to be blown through. Friday (yesterday) the Fibre was blown, the ONT installed etc. So currently we have (basic) fibre internet (I'm using it right now), however it has NOT yet been officially provisioned, so we are currently on 30/10, and routes may not yet be optimised etc. We currently seem to be on a "default" Snap! profile. Therefore I will withhold any speedtests from this thread until our connection has been provisioned. There were a lot of services in the area, and no one hit any of them, so that's a big plus! But communication was not the strong point of either UFF, Transfield, or Snap! The installers tended to have a habit of showing up without any advanced warning, and not once were we ever contacted by anyone from Snap! Thanks for the update. What area do you live in? DarthKermit: Thanks for the update. What area do you live in? I have signed up in the last few days as well. I don't have shared driveway issues, so no dramas there, but the date I have been given for Chorus to come round is 20 December... if it doesnt go smoothly, that doesn't leave a lot of room for things to get sorted before everyone buggers off on holiday. Plus if they damage my wife's garden she's gonna kill them, then probably me! After a bit over a week of chasing Snap and UFF, we finally have our UFB fully provisioned. So far we are pretty happy with the performance. Downloads are of course blazing fast, as expected. Compared to our Telecom ADSL, web browsing is a bit of a mixed bag. Some sites are definitely more responsive, however I have also come across web sites that are significantly less so. I assume this is to do with the different routes each ISP uses. Streaming media for all sites seems very good however. shermanp: Compared to our Telecom ADSL, web browsing is a bit of a mixed bag. Some sites are definitely more responsive, however I have also come across web sites that are significantly less so. I assume this is to do with the different routes each ISP uses. Streaming media for all sites seems very good however. Mostly caching i believe. Telecom runs a large cache farm, but i believe snap does not and opts for raw high bandwidth. Please correct if this isn't right (anyone from snap or who knows better). shermanp: Also, no one from UFF or transfield ever gave advanced warning for when they were going to turn up. Thankfully my father works from home now and so there was almost always someone home. When I had my install done we had chorus guys show up a few days early from their scheduled install date to begin the install, my dad was home for lunch so he told them to start. They basically did all of the outside work that didn't require them to be inside. They blew the fibre the next day (without telling us, just the ETP just had a sticker placed on it and was screwed shut). Then on the scheduled install day they finished the work.